As Nigerians abroad make their home country proud most of the time, some also bring shame to the country in different ways. A video of two Nigerian women fighting dirty in public, each yanking at least one piece of clothing material off the other’s body, is currently trending on social media. Two other women were captured fighting in the video, but theirs was less dramatic and didn’t involve the ripping off of clothes. According to popular social media user, kayode Ogundmisi, who shared the video on his social media accounts, the incident occurred in Stratford, London. 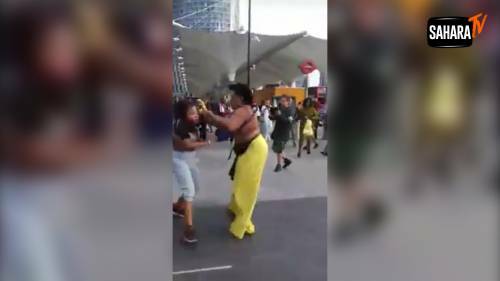 “Yoruba Women Gang War escalates in London as 'Omo Ewe' Esabod gang take on 'Omo Aiye' Abike Jagaban in Stratford London street battle on Facebook live,” he wrote. While one of the main fighters lost her top and brassiere and had a good-natured man to thank for blocking her naked chest region from the view of the camera, the other’s top was lifted to reveal her cleavage to the camera. The women, including many others nearby, were heard cursing in Yoruba. The Police eventually came in to find out what happened, but the fight had already died down by then.